It seems that any mapping project would have three basic data types– People, Locations, and Events. People because humans are usually important in these scenarios. Locations being important in mapping and events for things that have limited duration. Matt described it well as the Who, When, and Where. Those types could be associated with each other in multiple ways. A person might be associated with various locations and various events. Events might involve various people in various places. If I think too hard I’ll make this more complex. I feel relatively good about those three main types so breaking down the details of what those big boxes should contain was the next consideration. The items designated with the * are tied in via the ACF relationship field. This was something new to me but was super easy to set up. I turned on the ACF to Rest API plugin in addition to making sure these custom post types would appear in the WP REST API ‘show_in_rest’ => true. Now I’ve got a decent interface for backend editing that makes adding connections between all these things as easy as clicking. We’ll refine things more going forward but it confirms some solid options that we can build on. With relationships we can either return the ID of the associated post or we can return the whole post object. 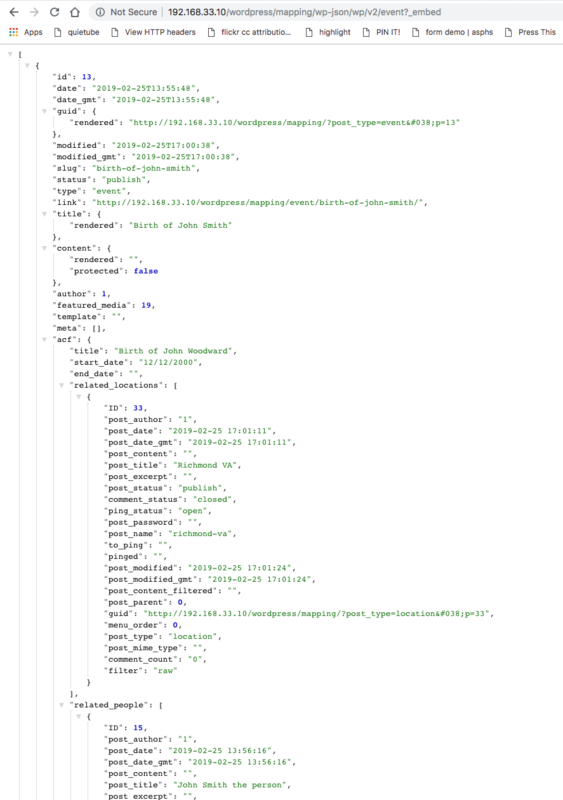 Now at the REST endpoints (wp-json/wp/v2/event?_embed) for the various post types we’ll get JSON like this. I think this is going to be very nice for some of the related navigation construction. 1 I started to write him an email but it go very long and emails aren’t friendly to some of the formatting so I figured why not write a blog post. If you use Advanced Custom Fields you may not realize it removes the ‘Custom Fields’ option from your Screen Options view and hides them entirely in the space they normally occupy below your posts/pages. That’s nice occasionally and a pain other times. Today it was a pain. I figured this out one time before but it took me a while to re-find it at this github page so I’m leaving it here in case I forget again. This looks super slick. I used to copy D’Arcy all the time, but now I am following your steps. Have not done much yet with ACF. Are there any Gutenburger issues? It’s really nice. It makes tedious things so very fast. He’s been in the lead with the Gutenberg stuff.